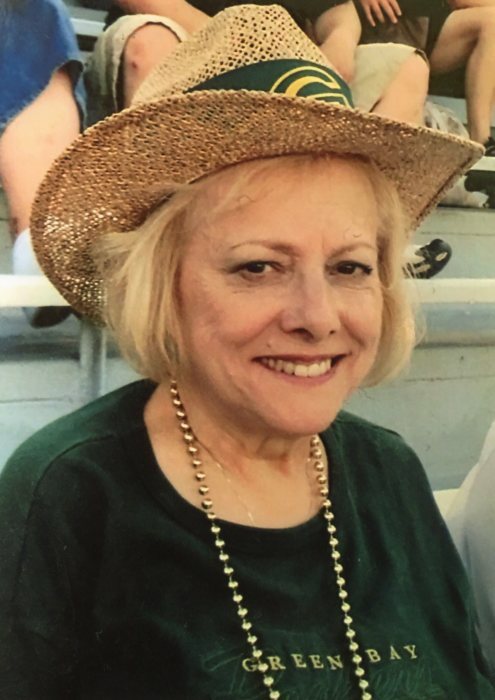 Karin E. Bergmann, 76, of Hartford, former resident of Slinger, passed away on, Tuesday, October 23, 2018, at Kathy Hospice in the town of Polk, surrounded by her loving family. Karin was born on November 18, 1941, in Oconto, the daughter of the late Clarence and Gladys (nee Crozier) Delcore. On September 9, 1960, she was united in marriage to Edward “Porky” Bergmann at St. Paul’s Lutheran Church in Slinger. Together, Karin and Porky worked to build their business, Bergmann Appliance & T.V. in Slinger, Wisconsin. They owned and resided there for over 40 years before happily retiring to their lake cottage in Hartford in 2012. She decided to return to school to pursue her nursing degree at Moraine Park Technical College and graduated in 1994. Karin was proud to serve as a registered nurse and supervisor at Samaritan Health Center for many years. She loved camping, going to Las Vegas, Packer Games, Toby Keith, living on Big Cedar Lake, and her family. Those Karin leaves behind to cherish her memory include her husband, Edward; six children, Edward (Elizabeth) Bergmann of Slinger, Patti (David) Krueger of Richfield, Michael (fiancé, Donna) Bergmann of Lomira, Lisa Free of West Bend, Thomas (Dawn) Bergmann of West Bend, and Amy (Damon) Kuritz of West Bend, and; five grandchildren, Cory (Stephanie) Bergmann, Jordan (Jesi) Bergmann, Alec (Kendra) Bergmann, Kendra Bergmann, and Taylor Bergmann; a great-grandchild, Kyra Bergmann; two brothers, Wayne (Carol) Delcore and Henry (Nancy) Delcore; nieces, nephews, other relatives and friends. In addition to her parents, Karin was preceded in death by three sisters, Phyllis (Fred) Hafeman, Shirley Fischer, and Cheryl (Dale) Adams; a brother, Ronnie (Mary Ellen) Delcore; and her parents-in-law, Edward and Lydia Bergmann. A Mass of Christian Burial for Karin will be held at Noon on Saturday, October 27, 2018, at St. Peter’s Catholic Church, 200 E. Washington Street, in Slinger. Rev. Richard Stoffel will officiate and burial will follow at Slinger Union Cemetery. Karin’s family will greet relatives and friends at church on Saturday from 9:00 a.m. until the time of Mass. The family would like to thank the nurses and staff at Kathy Hospice for their compassionate care in her final days. In lieu of flowers, please make donations to Kathy Hospice. The Myrhum Patten Miller and Kietzer Funeral Home have been entrusted with Karin’s arrangements. Additional information and guest book may be found at www.myrhum-patten.com.